Did I mention that the 2nd half of this class is all about using a die cutting machine! Well it is. 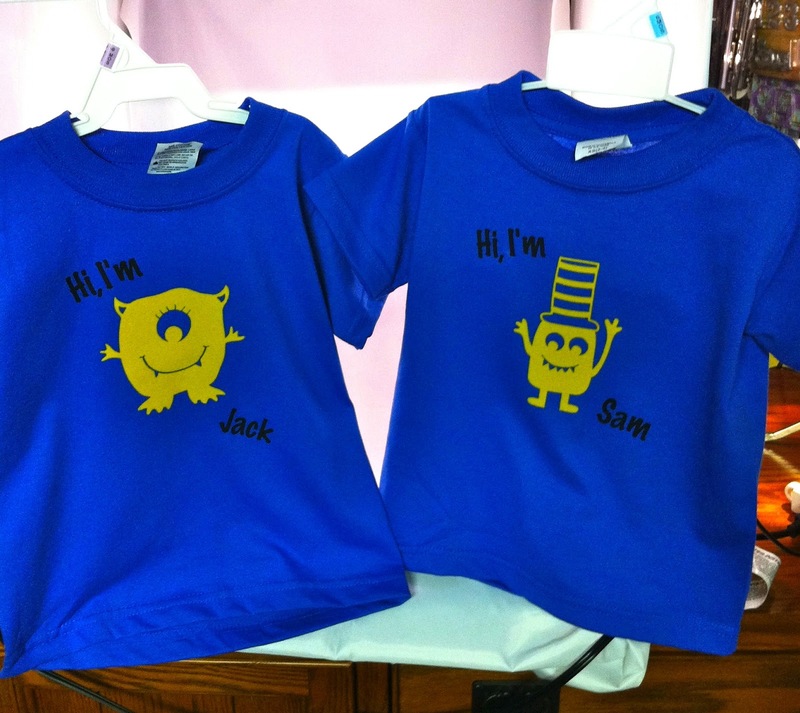 Here are 2 t-shirts I created as a birthday gift for 3 year old twins. 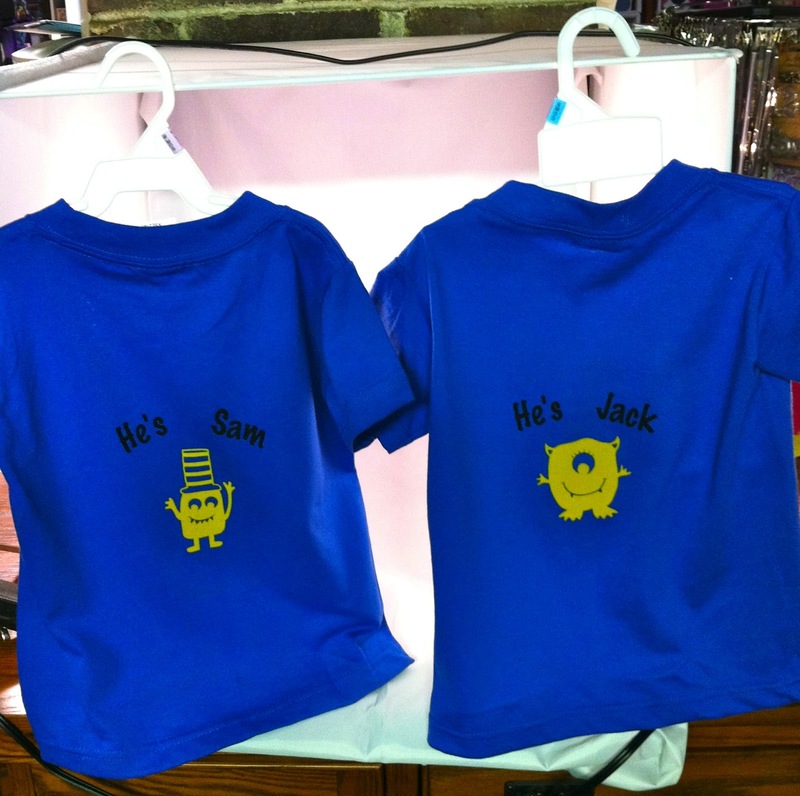 I got the idea from shirts a friend of my mom's had made for my twin brothers when they were little. the back of the shirts. I had so much fun creating these shirts. I used silhouette iron on vinyl and flocked vinyl. I felt like the shirts were too plain with just the words on them so I found these cute little monsters throughout the silhouette store. I made the monsters on the front of the shirts larger than the back. I purchased the t-shirts from Hobby Lobby using a 40% off coupon so the 2 shirts cost about $6 for the two! I look forward to trying this out for another friend of mine who has twin girls that are identical. Have fun with your Cameo! I know I am. So the many wonderful things they have taught us in this class is shaped cards. I haven't done a lot of shaped cards (outside of circles and squares) but I have done this one recently for a co-worker who's son's wife is having twins. 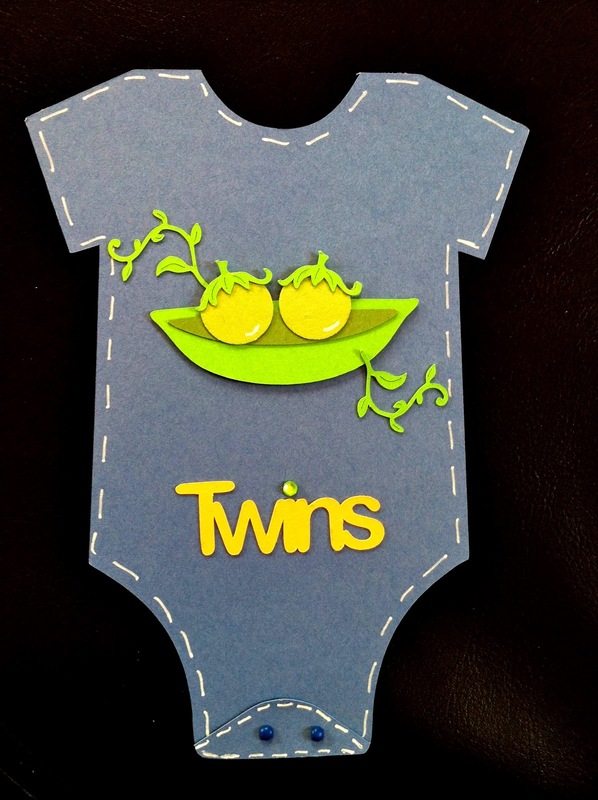 This entire card was created using my Silhouette Cameo. sorry about the quality of the photo but I didn't make any extras. I added the small brads on the bottom to represent the buttons. I also added a little crystal to dot the i. The white stitching was done with a white gel pen. I ran the leaves through my xyron to adhere which was much easier then a glue pen (which I started with). The back has all the information about the shower. Have fun creating with your Cameo! I know I am! Cameo Created Baby Shower invite! I am having so much fun with my Cameo these days. 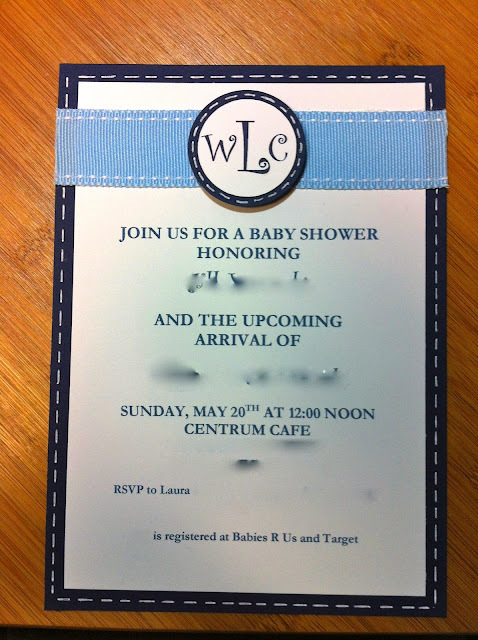 I have created some great baby shower invitations for a co-worker. Here's one for her daughter in law who is having a boy and LOVES monograms! sorry about the blurred parts. I thought it was only right to get rid of that information. I used my Silhouette Cameo for the monogram and the blue circles that monogram sits on. I could have stamped these and punched them out with a hand punch but the time I saved by having the Cameo do it and the cleanness of the monogram it self is well worth it. I used the print and cut feature for the monogram which I created by simply using the font. I used placed a circle down so I know the dimensions I was working in. I then cut and paste the number of monograms that I needed which happened to be 30. On a separate file I created the circles that I was going to put the monogram on. I cut them, popped the monogram up with pop dots and there you have it. I printed those on my printer and adhered them to the blue card stock. I used white gel pen and added the dashed lines. I really think that gave it a little something that it needed! I also added some ribbon that I had left over in my SU stash. Hi Everybody!!! I'm taking this great class from Online Card Classes all about die cutting!! Here you can see the detail on the detail of the glitter that I used directly on the die cutes. I used the following items.